Recently someone asked me how many times I waggle the club at address. My answer: I have no idea - it may be twice, it may be three times, or more. But I do know that when I'm playing well, it is the same number of waggles for each and every shot I play. Consistency in your pre-shot routine will breed consistency in your shotmaking. So if you haven't already done so, adopt a 'countdown', a checklist of preparatory movements that begins as you address your ball and ends when you take the club back. My own countdown begins from behind the ball as I get a mental picture of the shot I want to play. Then I step up to the ball, and holding the club in my right hand, I set it down behind the ball, being careful to get the exact alignment. 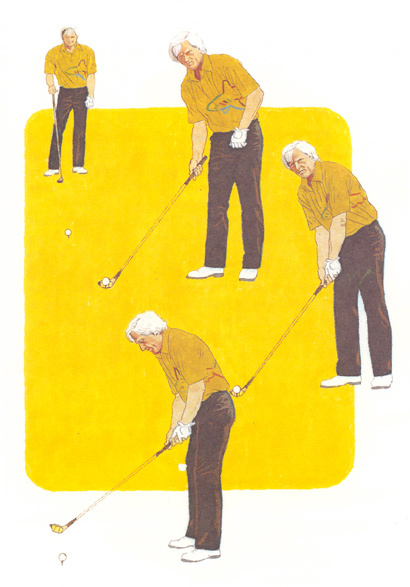 Once that's done, I put my left hand on the club and align my body parallel to the clubface alignment. Then I make those waggles, and I'm set to go. The reason I can't tell you the number of waggles is that my countdown has become second nature, an almost subconscious, natural continuum that flows directly into the swing. By adopting and ingraining this type of pre- shot routine, you'll keep out negative thoughts and ensure that you're fully focused on the shot at hand.